The prophet Ezekiel was writing of the destruction of the house of Israel some two hundred years after the political subdivision called the “Kingdom of Israel” was destroyed by Sargon II , and the southern Kingdom of Judah was sent into exile by King Nebachadnezzer of Babylon. When the northern half of the land of Israel was destroyed by Sargon II, he did what most conquerors did in that day. He would take the captives and disperse them through out the kingdom and replace the captives with other subjugated people transplanted from other areas of the empire to the land he had just captured. As time passed those subjugated people assimiliated to the new country they were taken to, and this country became their country. The point was to keep the captives and those conquered docile, because when you are a people without a country, there is not much reason to fight. This is how the Ten lost Tribes of Israel were lost to history and from the beginning of the 7th century BC, there was no place in the world called Israel. The surviving kingdom of Judah, known as the Jews, were eventually captured and partially assimiliated by the Babylonians in the 5th century BC. They survived their captivity in Babylon and later by the Medo-Persians, only because they were allowed to return to their own land by Artaxerxes. 11 “Then he said unto me, Son of man, these bones are the whole house of Israel: behold, they say, Our bones are dried, and our hope is lost: we are cut off for our parts. Here Ezekiel writes of the regathering of Israel to her own land in the last days. In Ezekiel 37, the prophet is shown a valley full of dry bones. God prophesied to Ezekiel that these dry bone would be restored to their ancient land in the last days. At the time of this writing, it would be six hundred years before the remaining Jews were scattered again by the Romans, but the Lord said Israel would be restored. The fulfillment of this prophecy could not be more obvious with the restoraton of Israel as a nation in May, 1948. The Jews of the Diaspora have indeed come from among the heathen from every side and returned to the Promise Land. Historically, in 1897, the first Zionist Congress petitioned the British Crown to allow the in-gathering Jews to set up a state in what was the British colony of Uganda. At the time, Palestine was in the hands of the Muslim Ottoman Empire. The British told them they should ask the Ottomans to let them have their historical homeland and turned the Uganda request down. Ezekiel prophesied that they would return to their own land, not a land in Africa that was not their ancient land, but return to the land God had given them by a promise made to their forefather , Abraham. Some will look at a passage in Ezekiel that says that the people of Israel will be in a “ land of unwalled villages” and wonder about the wall that Israel has built to protect themselves from terrorist of the PLO. In Ezekiel's day, moats and walls to protect against invaders was a common strategic option. For this reference to a “land of unwalled villages” was a generally interpreted as a metaphor for a condition of peace, rather than a literal condition, although in Israel the peace is fragile as they have Muslim terrorist that fracture the national peace. The only other modern equivalent would be the Berlin wall but was built to keep people in, rather than keep people out. But Ezekiel's walls are clearly defensive -- the whole 38th chapter is about a war of invasion against Israel. And today, 2500 years after Ezekiel foretold it, and more than sixty years after Israel's restoration, the Israelis are building a defensive wall around their country. Most of it is complete, but Israel continues to build. It is proving its worth, as the threat of terrorism has been drastically decreased, but it equally certain that the wall will come down during the coming Tribulation. The entire world community opposes it (although they are having a hard time explaining why) and is why Israel did prepare to mount its defense at the trial before the World Court in The Hague to justify its continuation. And so at the present, the wall stands. In recent weeks, a new chapter in the madness of the World Community concerning Israel has flooded the news with its continued insanity. With all the problems we see in the Middle East with the civil war in Syria, the rise of ISIS killing Christians, and anyone that doesn't line up with their hateful ideology including Sunni Muslims, nuclear aggression by an insane leader in North Korea, Iran building nuclear facilities to manufacture a nuclear weapon to control the whole Middle East and still threatens Israel with annihilation, the U.N. has condemned Jewish settlements in Judea and Samaria as illegal and demanding they return to their pre-1967 borders that are indefensible, giving up East Jerusalem, the Temple Mount and the Wailing Wall to the likes of the so called “Palestinians”. Where are their world political priorities to single out Israel? What makes a true Christian supporter of Israel's sovereignty and right to the land God gave them thousands of years ago completely baffled, is the traitor in the White House who refused to veto a resolution that condemned Israel for their “illegal” settlement activity in the West Bank which they captured in the war with the Jordanians. 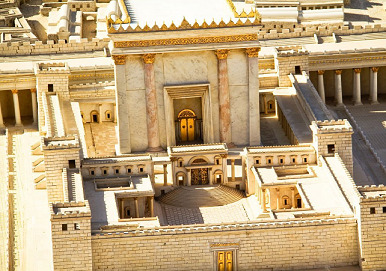 Israel was first attacked first by their Arab neighbors and captured these Biblical areas of Judea and Samaria, along with the Temple Mount, part of their ancient homeland. This has put Israel in a very precarious situation that the incoming Trump administration realizes, and unable to do anything about it at the moment, but the damage is not over. The present POTUS is showing his true anti-Semitism by continuing to abandon Israel and making their position in the world more precarious. 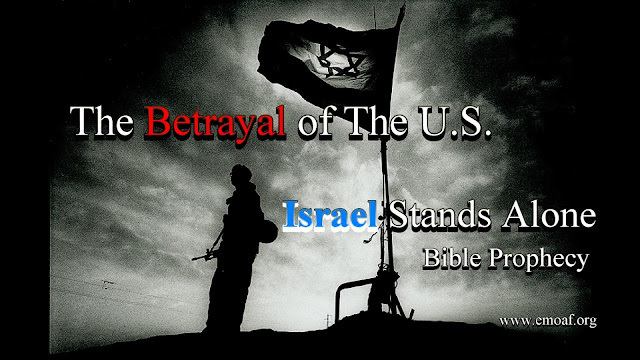 Many feel the aforementioned betrayal that this present “idiot in chief” was a collusion between the USA White House and the U.N. To demonize Israel and bring sanctions against her by the international community. But remember, the damage is far from over. Our fleckless commander in chief is not done with his betrayal of Israel. Coming this January 15th, there will be seventy countries that have requested to attend a Paris Summit and have their say at the high-level get-together over the stalled two-state solution of Israel and the Palestinians. Yet the two parties whose fate the meeting is aimed at deciding, have only been invited to meet separately at the conference’s conclusion. President George H. Bush promoted the Madrid Peace Conference, where he attempted to divide the land of Israel in exchange for “peace” with the Palestinians. The next day, the perfect Storm came with 30 foot tidal waves and destroy Pres. Bush's Maine home. The Madrid Conference was not successful the first time around, so a year later President Bush tried it again. Evidently, God’s opinion of a “land for peace” deal had not changed in the preceding 12 months, and disaster struck again…on the very same day. Hurricane Andrew visited Florida and caused billions in damage. President George H. Bush promoted and proudly signed the infamous Oslo Accord. The same day Hurrican Emily slammed the Outer Banks with 115 MPH winds. -1994 16 January, Talks to give up the Golan Heights by Slick Willy Clinton. A devastating 6.9 earthquake hits southern California and was the second most devasting earthquake to hit the USA in it's history. -1998 21 January , Impeachment. Prime minister Benjamin Netanyahu is coldly received by Pres. Clinton and the Monica Lewisky scandal broke out, and resulted in impeachment proceedings for Clinton. Two days later, Texas is hit with devasting tornados and heavy flooding. -I could number each one of the attempts to divide God's land and each time, disaster has struck, but the worst was in 2005, America pressured Israel to give up the Gaza Strip. “Katrina raced directly toward New Orleans, harnessing deadly strength every moment. Literally recording wind strength “off the scale” On Monday, August 29, the nation watched in horror as deadly Katrina slammed and slaughtered the fragile Gulf Coast. Destructive Katrina left beautiful homes as piles of worthless rubbish. Deadly Katrina tossed bodies like litter along the highway. When Katrina ended her deadly mission America suffered the worst disaster in her storied history. As I saw the thousands of homes destroyed, my mind kept going back to those U.S. ordered bulldozers destroying the Jewish homes in the Gaza Strip. As I saw the thousands and thousands of United States citizens being evacuated from their land, my mind could not keep from remembering the Jewish people crying and literally begging to stay in their land. America found no mercy for the Jewish people. Back in Israel Ariel Sharon, the Prime Minister at the time, suffered a massive stroke and lay in a vegetative state for many years before finally succumbing to his massive brain bleed...no matter if you're an American, or a faithless Israeli commander of the armed forces of Israel, you mess with God's land or His people, bad things seem to happen. There are many tragedies associated with Israel and the international community attempting to divide God's Land. Obviously, the present administration thinks they are exempt and again are attempting to try and divide God's Land...I pray God will view this as a product of a godless regime and take out His anger on those who precipitated this act of being a traitor to the only democratic ally we have in the Middle East. What will become the next story that will add to the reprisal of an angry God messing with His land or His people?? I see major environmental flooding and record snow falls in California into Nevada...A product of this last U.N. vote...? The U.N. coming against Israel will only isolate Israel even further, unless a Trump administration stalls that eventual slide. We have to stay attentive to that development and see what a POTUS Trump will do about the treachery done to God's people. ...You see the Dominos lining up and each are beginning to fall, as the world flies head long into the coming Tribulation and the removal of God's church from this planet. The political news is moving so fast, that is hard to keep up. Russia in the Middle East making nice to Iran, fighting in Syria and the possibility of the Oracle of Damascus being fulfilled, the isolation and treachery heaped upon God's land and people....a coming war prophesied of the Gog-Magog invasion, and most likely bringing about a 7 year treaty with Israel because of the total devastation that rained down upon the invaders. 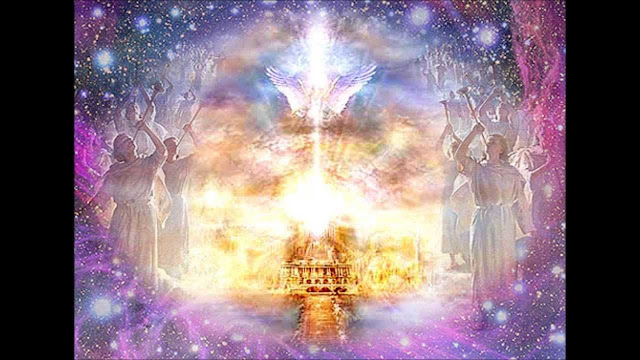 Thus ushing in the coming 7 year tribulaton that looms larger, as the puzzle pieces are ushered into place waiting for their act in world history to be orchestrated by the God of the universe. If anything, those reading these passages can see that a war could break out any minute between Israel and the God of the Universe in this corner...and the Gog-Magog coalition in the other corner...when fighting starts, it will be a mass suicide of those who dare come against God's ancient people who He has gathered on the mountains of Israel. If I'm right, and this signals the coming treaty of 7 years, the wrath of God will fall on this planet and the Tribulation will begin as our Lord Jesus breaks the 1st seal and each seal of the title deed to this earth, which He created and bought with His blood. But just prior to that historical event, another most important event will take place, as all hell will break loose and the devil and his evil host will attempt to destroy all of mankind, and to secure worship for himself, as he has lusted for power reserved only for God Almighty, when he brings the Anti-Christ upon the world scene.